We had a shock the other day when cleaning out the office. If you’re anything like us, you tend to hold on to old drives simply because it’s hard to dispose of the data securely. You soon realize you have old hard drives you’ve never dealt with and even obscure NAS drives collected over many years. We found old drives going back to 2000. One solution is to pay for a professional company to pick up, wipe and dispose of these used drives, but this is a costly procedure. Why not do it yourself and save a ton of cash in the process? O&O SafeErase 14 is a commercial tool you can use to either wipe an entire drive or securely erase files which will result in no-one being able to recover data from your system. When you dispose of an old computer or hard drive, even if you delete and remove the content, most people can use recovery tools to scan your drive and retrieve deleted data. SafeErase 14 can use six deletion methods to make sure any data is safely and fully removed from your computer. Deletion methods include those used by the US Department of Defense (DoD) and the German Bundesamts für Sicherheit in der Informationstechnik (BSI). Gutmann Methods also allow overwriting of data 35 times (although this leads to a very slow erasure process). SafeErase 14 includes a module to remove browser data from your PC, with Chrome, Firefox, Edge and Internet Explorer supported. There’s also an option to remove installed applications, freeing up essential drive space. 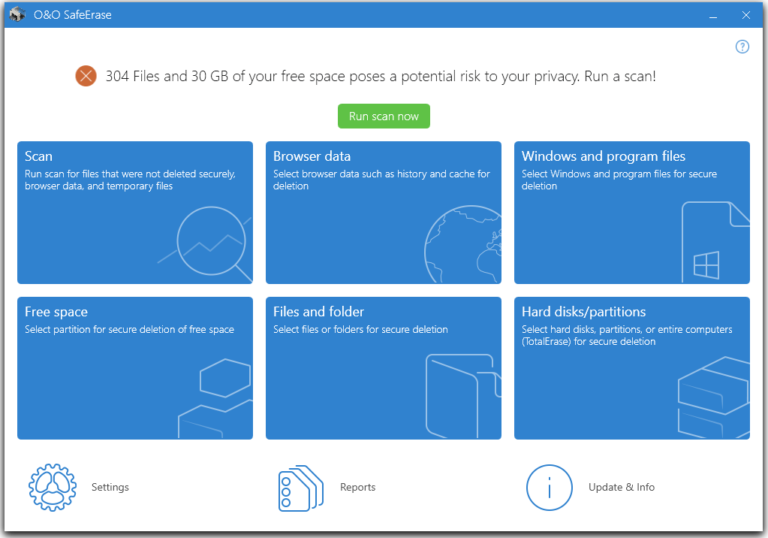 Another module will even scan your drive and find files you’ve deleted but could be recovered, enabling O&O SafeErase to wipe them using secure methods. So, what’s new in v14? The user-interface has been completely re-worked and is now faster and fully-compatible with the highest resolution displays. Support for the latest web browsers has been included and the TotalErase algorithm, which is essential for fully wiping an entire drive, has been completely revamped making the process quicker to complete. Prices start at $29.95/€29.90 for a 1-PC license, or you could move up to a 5-PC license, suitable for a small office, for $49.90/€49.90.